Do you change out the quilts on display in your home with the Seasons? I do. 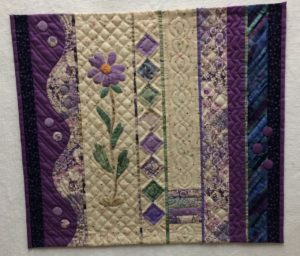 I like to look at my quilts whenever possible and not just keep them stored away so I rotate the quilts on the walls four times a year. My biggest struggle is January – May. I never know if it should be winter quilts, spring quilts or a combination of both. Christmas quilts in November and December are easy. I love fall quilts with all the green, brown and orange colors and in the summer, I go Patriotic with lots of red, white and blue. I thought I would share a few of my smaller winter/spring favorites. This first quilt (22.5” x 20”) was made by Opal Frey and I was fortunate enough to purchase it at RMQM Fabric and Friends auction several years ago. She hand appliqued and hand quilted it. It is one of my favorite quilt treasures. She made it in 2012 and called it “Ode to Wisteria”. I love her fabric color choices. She is still missed in the Denver quilt community. The next quilt (27” x 27”) was part of the result of a block exchange in one of the quilt groups I belong to. 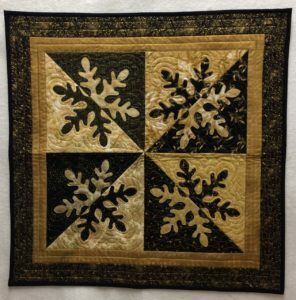 For Christmas we did a block exchange and we all agreed to make blocks that were black and gold in snowflakes. I ended up with lots of blocks and I have the rest of them (enough for a twin-size quilt) in a UFO tub but first I made a small wallhanging out of just four blocks. At least I get to enjoy this one while I wait for the larger one to come up on my UFO list – it could be a few years. I have pulled out my six quilt UFOs to work on this year and I’m excited about finishing them. I will share more as I finish each one. The last quilt (25” x 25.5”) is one that I made from a Carolyn McCormick pattern (she is the one who invented the Add-a-quarter ruler). It is paper pieced, and it makes me smile when I look at it. It holds such hope for spring and those precious little crocuses that first appear even when there is still snow on the ground. After all the snow we had this past weekend I am already waiting for spring. 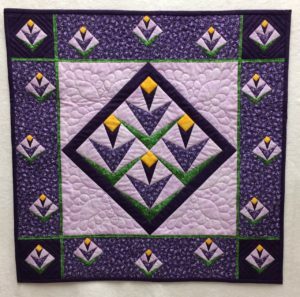 I know it will still be a while since it is only January, but I can still hope when I look at my spring quilts. I’m sure your Christmas quilts are put away and I hope you have pulled out your winter or spring ones to enjoy. Maybe you even want to make a new one! ← 2019 Letter A News and SALE!